When, back in September, Hantu Biru sailed from Poole to Southampton for the boat show, it was her first proper voyage. 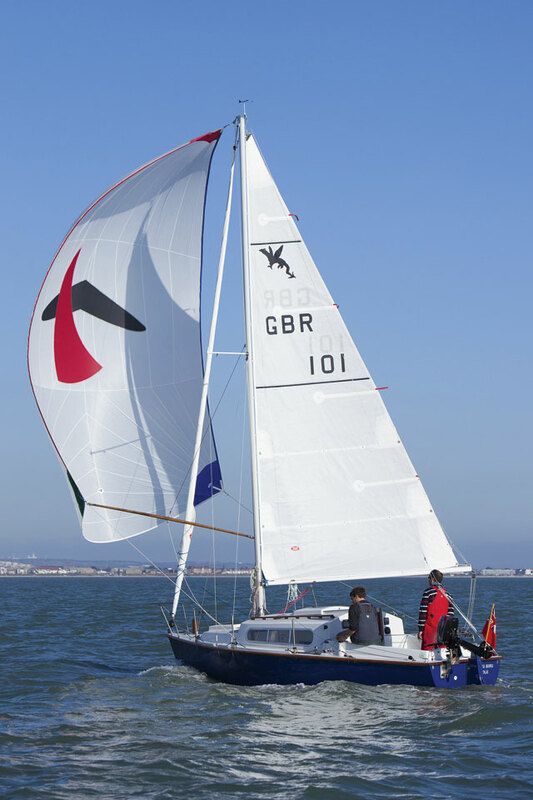 It was also her first outing with new sails, the making and measuring of which we covered in the November issue. Made by Kemp Sails, the new suit replaced what were quite possibly her originals from the 1960s: a mainsail and the enormous blue and white stripy mitre-cut No1 that graced September’s cover. There were No2 and No3 headsails as well. All had hanks, but the decision was taken to fit a roller-reefing system as part of the project (covered in PBO October). With the arrival of the new sails came an opportunity to compare the new with the old. We could sail the same boat on the same day in the same conditions and see just what difference the new sails actually made. 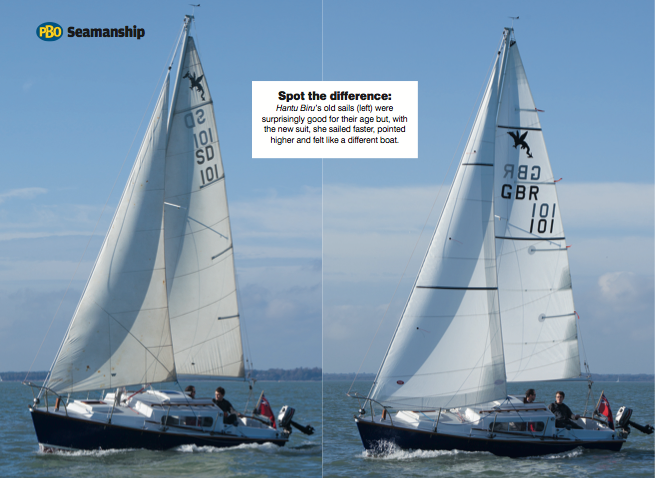 So, on what turned out to be a glorious autumn day, editor David Pugh, deputy editor Ben Meakins and I went out on the Solent for a game of ‘spot the difference’. One concession we’d had to make was having the hanks removed from the old No2 and replaced with a luff tape for use on the new headfoil. We had explored the possibility of keeping it as a hanked sail and then swapping the forestay for the furling system so we could set its roller-reefing replacement. It was a nice idea but the logistics made it impractical, so a luff tape on the No2 it was. We chose the No2 for comparison because it was roughly the same size as the new roller-reefer. Like the No2, the new sail had to sheet inside the spreaders to give us any pointing ability. A further consideration was that, no matter how well it’s cut, a sail as big as the old No1 – which was awkward to tack, to say the least – would lose much of its shape by the time it was reefed down to working-jib size when the breeze picked up. Our plan was to set off with the old main and No2 and to sail upwind, noting boat speed and tacking angle together with heel and other elements that are harder to quantify such as weather helm and how the boat feels. Then we would change to the new sails and repeat the process in conditions that, we hoped, would still be the same to give a fair comparison. It could never be precise because Hantu Biru has no instrumentation to indicate either wind speed and direction or VMG (velocity made good). In any event, by far the best way to gauge the effect of any changes is to sail against a similar boat as a yardstick. This is where David and Ben had fallen down: they had neglected to buy and restore a second Snapdragon 23, so we were on our own. As well as the upwind sails, Hantu Biru has an old and a new spinnaker, so after making our way upwind we would turn around and try both kites in turn. Let’s take a look at the differences in profile view shown by the two photos (above). 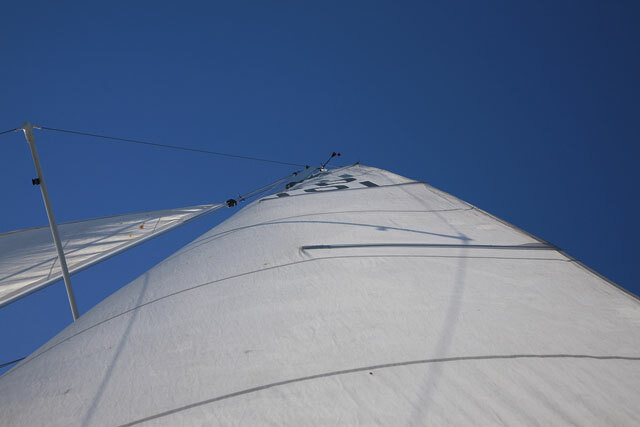 Starting with the headsail, note the round in the foot of the new sail and its lower clew, both of which increase its area. The area is further increased by the extra luff length. This in turn calls for greater hollow in the leech to keep it forward of the spreaders, thus ensuring the closest sheeting angle possible with a rig that has long spreaders, outboard rigging and forward lowers. 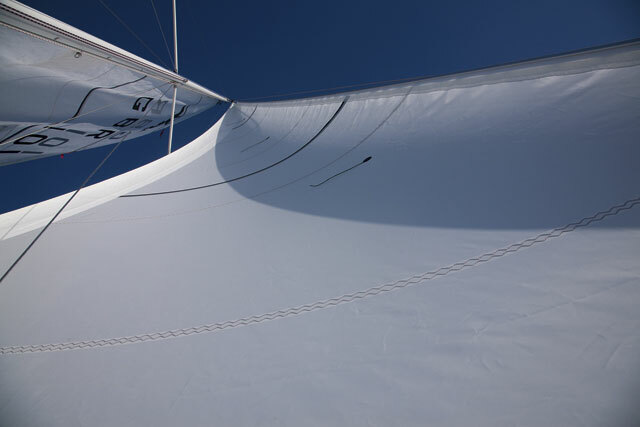 Because this headsail was made for roller reefing, it has UV strips along the leech and foot. Note too the graduated reinforcement at the tack, head and clew to spread the loads, and the difference in the panel layout. The old sail was a mitre cut, which fell from favour in the 1970s because of developments in cloth manufacture, whereas the new one is cross cut (horizontal seams all the way). Turning to the mainsail, we can see that it’s also longer in the luff: there’s no point in wasting hoist. It also gains area though increased roach, though the leech is slightly shorter as indicated by the angle of the boom. The corner reinforcement is similar to that on the headsail. 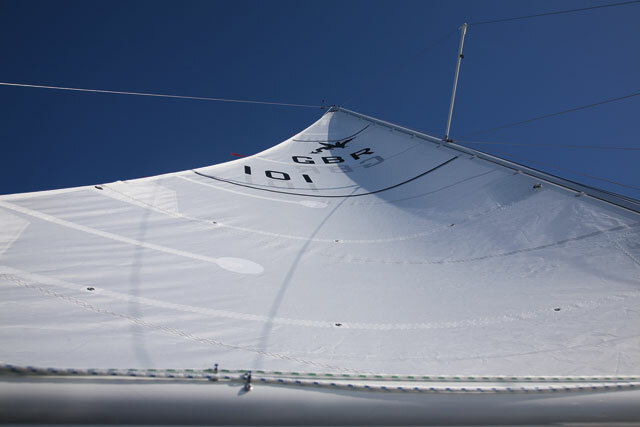 In addition to the corner patches, reinforcement can be seen in the leech because, unlike its roller-reefing predecessor, this mainsail is designed for slab reefing. Another difference is apparent if you study the foot. 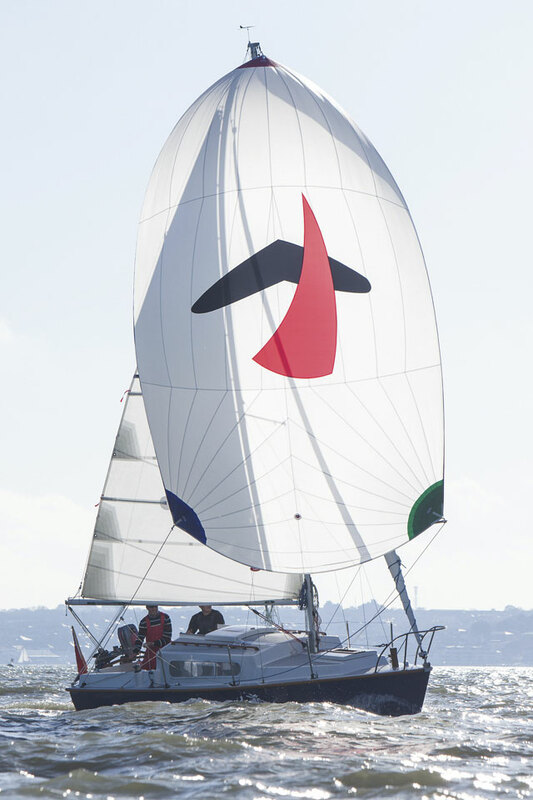 Whereas the old sail has a bolt rope, Kemps have made its replacement with a loose foot, as are many (if not most) mainsails made over the past couple of decades.There are pros and cons to each approach, but benefits of a loose foot include simpler construction and greater area through foot-round. A loose foot also allows the use of strops over the boom to attach the kicking strap, for example, reducing point-loading through fittings that are riveted in place or slid into grooves. Having fewer protruding fittings on a boom also makes life safer. As we have said many times in Sail Clinic features, sails made from woven synthetic fibres (Dacron being the near-universal choice for upwind sails) often stay in one piece long after they’re past their best-before date. Such is the case with the sails on Hantu Biru. The stitching is beginning to go and it’s doubtful how much breeze they could take before blowing out, but they’re still functional – after a fashion. Such ultimate durability can cause problems, however. If sails are intact, don’t look horribly creased to the casual eye and still drive the boat along, how do you know when they’re past it? This sail shows the classic symptoms of ageing, largely because the cloth has stretched. It’s too full and the maximum draught (the deepest point of the sail) has moved too far aft – beyond the halfway point from luff to leech. The shadow behind the mast shows up the unevenness: it should describe a smooth curve without any of these bumps and hollows. in tapered glassfibre. The original battens would probably have been in Tufnol or hickory. The leech is clearly stretched and distorted. Principal differences are that the new sail is appreciably flatter than the old one and the draught is further forward. The camber is also much more even, showing none of the distortion or S-bends present in the old sail. Camber stripes make it much easier to read the shape, and telltales indicate whether the sail is set so the leech is working efficiently. 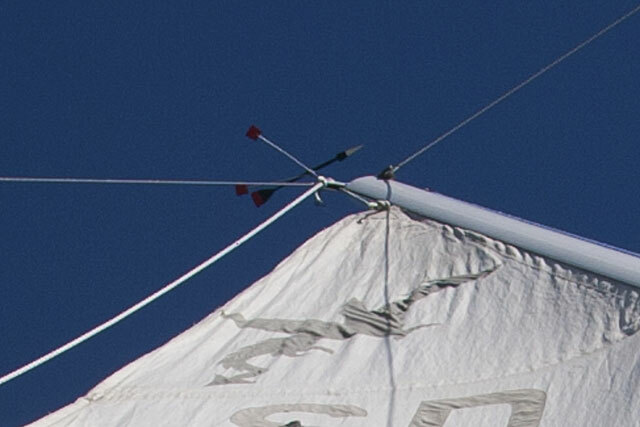 The tack’s attachment point is well abaft the line of the luff where it exits from the groove in the mast. 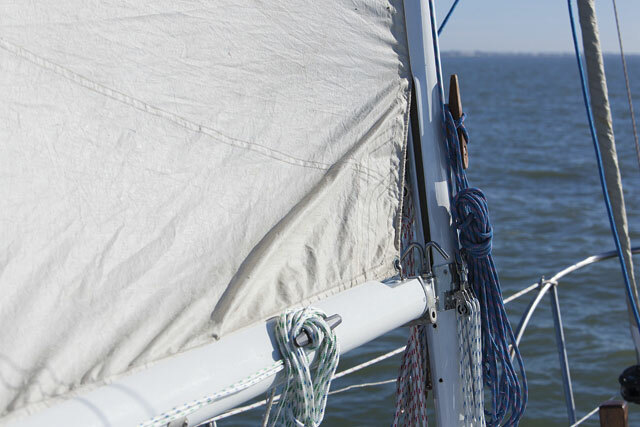 A sail should be made with the cut-back angle of the tack taken into account. This one wasn’t; hence the crease. Here the bolt rope in the foot has shrunk, as bolt ropes often do. This made it impossible to tension the sail properly because, even when the rope is under tension, the cloth isn’t. In this case, with the tack set so far back, we also ran out of boom length to tension the outhaul as much as we could have. The result is a lot of go-slow creases. … and allowing us to apply more foot tension. Nothing short of sail surgery (not worth it with this sail) would resolve the problem, but this has helped. Given its age, this No2 isn’t doing too badly. As with the mainsail, the draught has blown aft. The luff has stretched between the hanks, too, which is why it’s puckered where the new luff tape has been added. It can be hard to read the shape of a sail without camber stripes (stripes running from luff to leech in a contrasting colour). As with the new main, the new headsail is both flatter than the old one and with the draught further forward. Also in common are the camber stripes and telltales. A few horizontal creases in the luff are normal with a new (un-stretched) sail. We had to spill the wind from the mainsail to keep the boat upright enough for this photograph to be taken! Now that we have looked at the differences in the sails themselves, what about Hantu Biru’s performance? As I mentioned earlier, precise measurement wasn’t possible – but neither was it needed, because the contrast in speed, pointing, tacking angle and feel was so pronounced. we would quickly be down to low-to-mid 3s. In practice we often sailed deeper than 50° to maintain our speed. Under her new canvas, Hantu Biru pointed appreciably higher. The difference by the compass was at least 10° – a tacking angle of 90° – and that, combined with a speed that was consistently about 0.3 of a knot higher, made a big difference to our VMG. We also lost a lot less speed if we squeezed up. by heading but, for a simple comparison in this case, let’s just divide our tacking angle by two. With the old sails we multiply 4 knots by 0.643 (cosine of 50), giving a VMG of 2.57 knots. in the gusts, and so on. No wonder the boat felt sharper, punchier and more responsive. 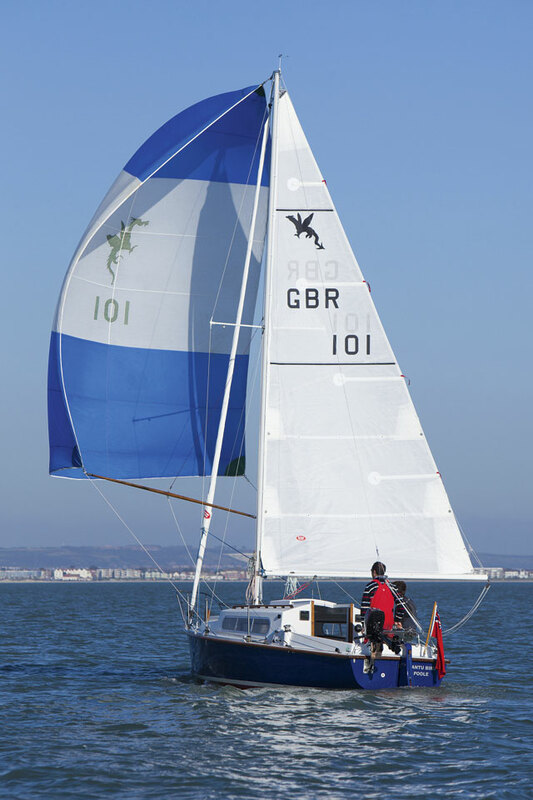 …whereas with the new sails it looked more like this! 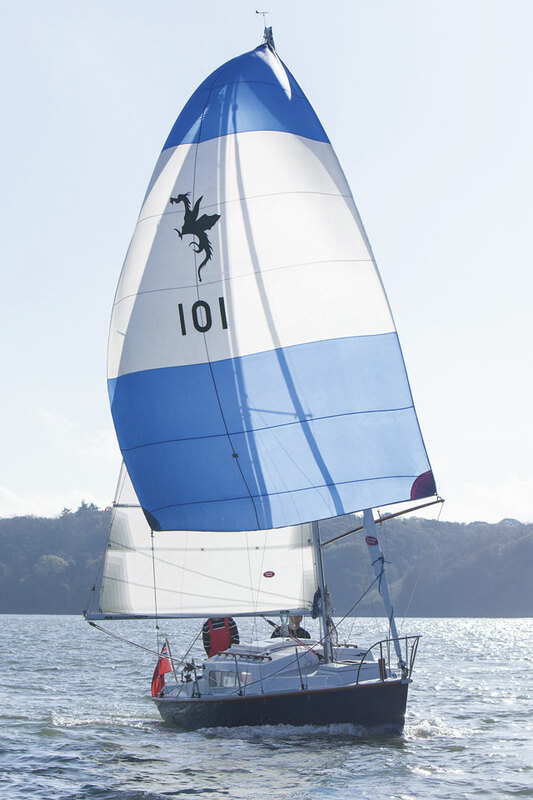 Together with her Kemp upwind canvas, Hantu Biru was treated to a new spinnaker from Rolly Tasker Sails (an Australian maker with a loft in Phuket and now represented in the UK). 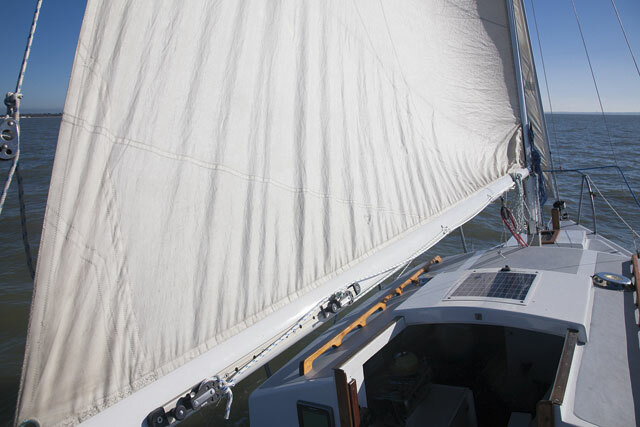 It’s easy for cruising sailors to imagine that one downwind sail will behave much like another of similar area, but sailmakers devote as much research to the development of spinnakers and asymmetrics as to mainsails and headsails. Probably the same vintage as the upwind sails, the original spinnaker was fully cross-cut (horizontal seams all the way up). Spinnakers haven’t been made this way for decades. It was also short in the luff and leech and, therefore, substantially smaller than it should have been. As tends to happen with old spinnakers, the nylon cloth had stretched while the luff and leech tapes hadn’t. 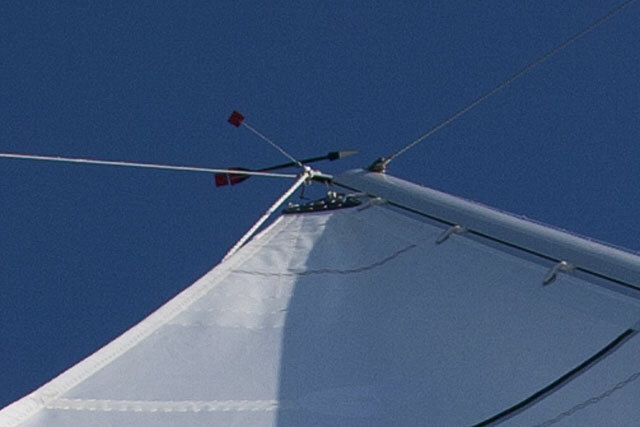 This exacerbated what had probably been a full cut to start with, making the sail hard to keep flying even downwind, reducing its drive and limiting its capabilities when we brought the wind forward: an apparent wind angle of just abaft the beam was the closest we could manage. Apart from the shape, cloth degradation was an issue too. 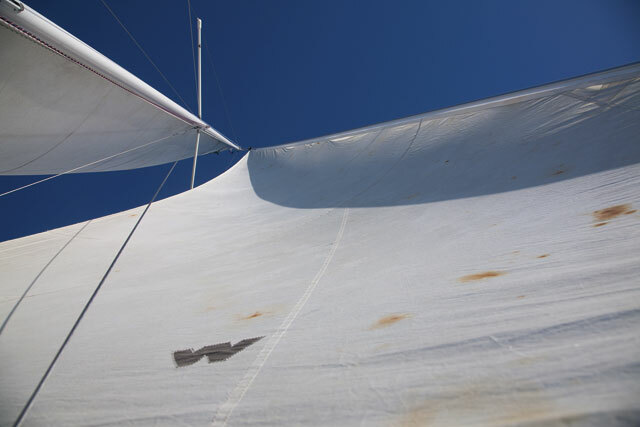 Once spinnaker nylon becomes worn and loses its finish, water no longer beads and runs off, it’s much harder to stuff the sail down a hatch or hoist it from a turtle because of increased friction, and damage from catching or snagging is increasingly likely. As spinnakers now usually are, this one is a tri-radial cut, with the panels radiating from all three corners. 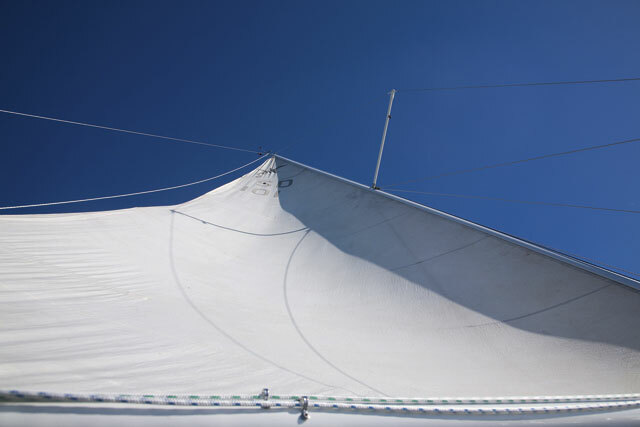 Combined with modern spinnaker nylon it gives a much more stable shape. 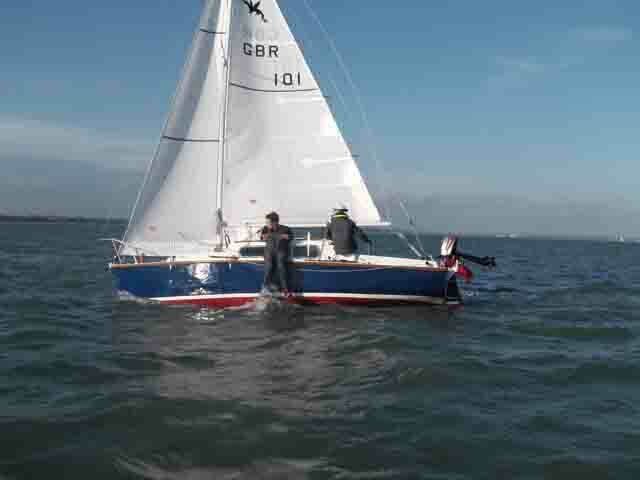 Being the right length in the luff and leech, the new sail is a good deal bigger than the old one. As it’s also a more efficient cut, and still the shape it was designed to be, it pulls a lot harder in the right direction. As with upwind sails, a spinnaker’s area, shape and cloth weight can be optimised for a specific range of wind strengths and angles. That’s why race boats tend to carry several, while cruisers and club racers are more likely to have just an ‘AP’ (all-purpose) spinnaker like this one on Hantu Biru. Not only did it fly well, boosting our speed on all points of sail, but it also proved much less prone to partial or total collapse if the wind shifted or the trimmer allowed his attention to wander. Incidentally, if you notice the unconventional colour-coding in the photos, don’t worry – apparently that’s the way the loft normally does it, though the corners are labelled (in this case, head, tack and clew). If you weren’t convinced about the differences from the quarter, this should do the trick! More speed and an easier life can go together. Greater stability in a spinnaker means less frustration for the trimmer, while crisp, shiny new fabric makes for easier hoists and drops. Stability helps boat speed too, because a little luff-curl is less critical. Quite apart from that, our new sail is simply faster all round. With the old one the log stayed in the 6s. The new kite took us to a peak of 7.2 knots – not bad for a 1960s 23-footer in a Force 4 and flat water! 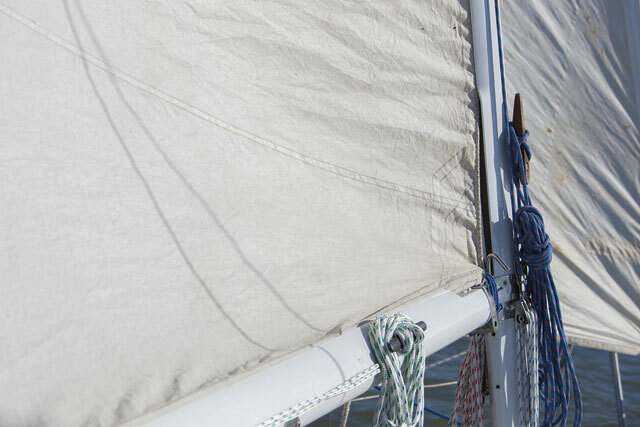 If your old sails are past their prime, a new suit will make an enormous difference. It’s not all about speed. It’s about efficiency: converting wind-power into forward motion, minimising heel and weather helm, and making the boat more responsive, easier to handle and more comfortable. You wouldn’t drive a car with bald, under-inflated tyres even if they were legal, so why go afloat with baggy old sails? Let’s not forget one more point: enjoyment. 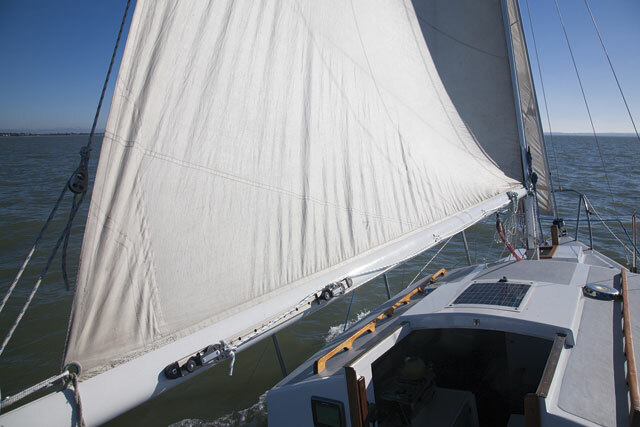 A boat that’s comfortable, responsive and rewarding is more fun to sail. Towards the end of our trials, Ben and I were beating into about 15 knots of wind and decided to pull out a few more stops. Light boats like this are highly sensitive to weight distribution, so Ben hiked out racing-style on the weather rail. Has this ever been done before on a Snapdragon? As we had enough wind to generate a modest but consistent weather helm, I rigged up a lashing on the tiller as a substitute tiller extension and moved into a semi-hiking position at the forward end of the windward cockpit coaming, mainsheet in one hand and tiller-extension line in the other. Hantu Biru responded and changed up another gear. So here were two racing sailors enjoying beating to windward in a Snapdragon 23 – probably a world first and, as far as the new sails were concerned, case proved.